Every dining room deserves a little green. 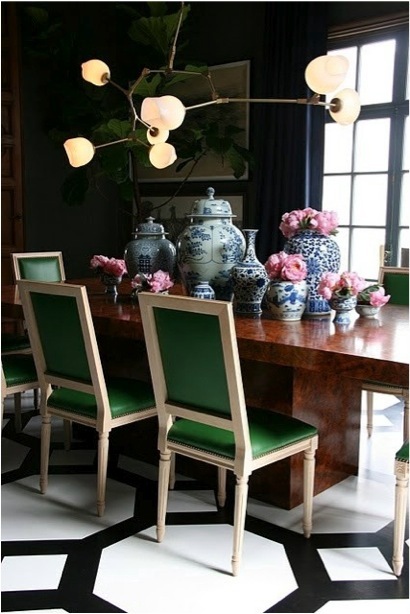 Whether it be upholstery, drapery, a light fixture or a simple centerpiece, green ranks highly in my book. Color theory classes and general knowledge of Feng Sui taught me that green is a relaxing, soothing color and slows your heart rate. It's the perfect color for a room where you gather with loved ones and share a meal. Especially if you're like me and only get the chance to actually sit down for dinner every few months. 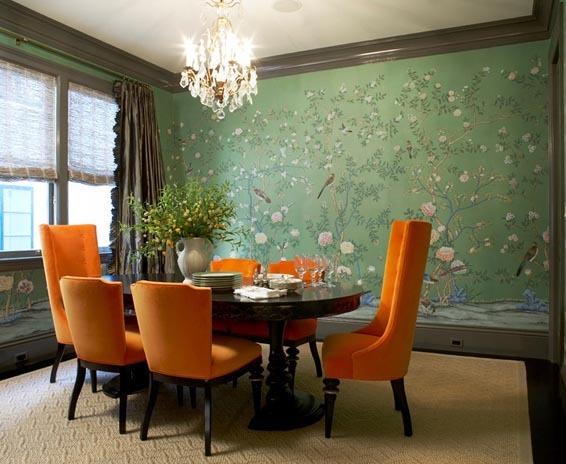 I love the soft green wallpaper juxtaposed with loud orange chairs. Playfully chic, no? That Lascala chandelier needs in my life. And who doesn't love a little lacquer? It's the perfect time to stock up on your holiday entertaining supplies and appropriate decor. Monogrammed coasters, anyone? I love emerald green!! It's such a rich looking color. Stop giving me more reason to call you the minute I move to Houston to help me decorate!! Green is great! So many shades to add dimension to a room. 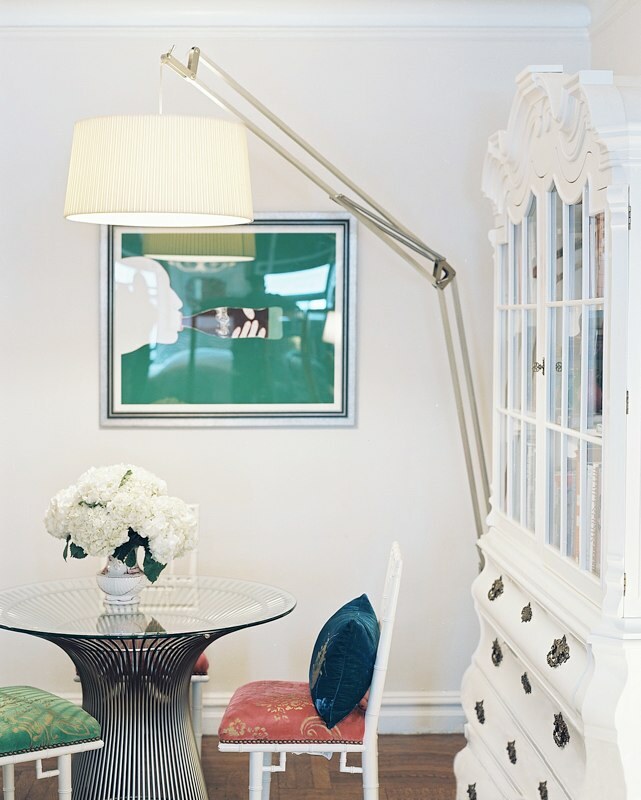 And, as Colorist, Maria Killam says "Green goes with anything". All those pictures are gorgeous! I love all your picks, those bowls are so fun! Oh my! Couldn't agree more... love the 2nd and 3rd examples. Beautiful! I am getting those green ikat plates right now! Photo #1 is pretty close to perfect. OH MY GOSH...so many pretty pictures. We don't have any green in our home. This must change immediately! Loves it...especially the first room. And oh those orange chairs! Freaking love green. Love!! Love all of your suggestions too. Looking to slow my heart rate. Really loving that green wallpaper. How lovely is that? I am such a lover of green!!! Pretty much in all it's lovely shades...and oh. em. gee. 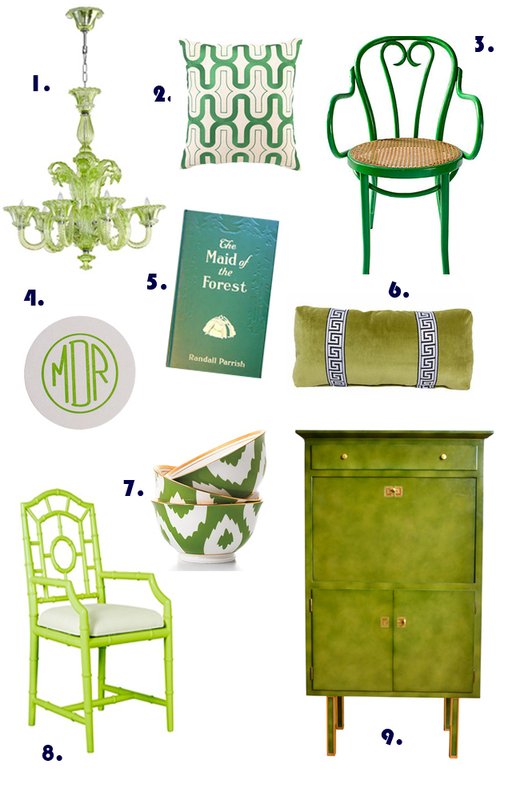 I need that whole list of goodies, especially that #3 chair, the *perfect* kelly green!!! Revamping my bedroom right now with touches of green. Love it! Green, light blue and gold have always been my house colors, even when I try something new, I am always drawn back to them!